Johnson was a commissioner of the FCC and now teaches at the University of Iowa College of Law. 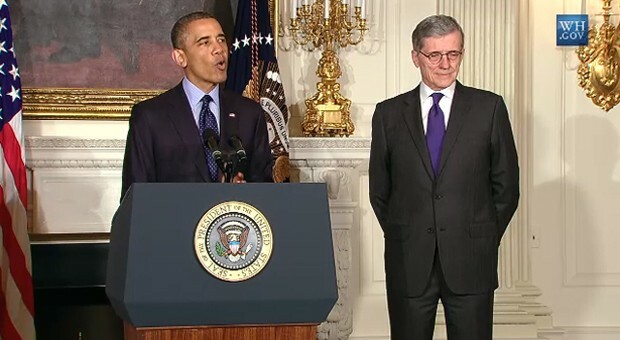 He said today: “President Obama’s choice of Tom Wheeler as FCC chair is bizarre. Sure, he was a major campaign contributor — even a bundler of others’ large checks. But being appointed FCC chair is not like becoming an ambassador to a small country — the usual reward for financial support. “There is no single independent regulatory commission that comes close to the impact of the FCC on every American’s life. That’s why Congress, in creating it, characterized its mission as serving ‘the public interest’ — an expression used throughout the Act. “Wheeler’s background is as a trade association representative for companies appearing before the Commission, a lobbyist in Congress for other FCC customers, and a venture capitalist investing in and profiting from others whose requests he’ll have to pass on. He has no record, of which I am aware, of challenging corporate abuse of power on behalf of consumers and the poor. “This is not the kind of FCC chair Congress had in mind when creating the agency, nor what those in the Democratic wing of the Democratic Party had in mind when voting for Obama. Where is our ‘Hope’? Where is the ‘Change’? “The business community has been doing very well at the FCC. They don’t really need any additional help from Wheeler. Parents, children, the poor, rural residents, small business, minorities, women and consumers have not done so well. They do need help. “Nor does Wheeler’s membership on the President’s Intelligence Advisory Board bode well for those who believe Americans’ Fourth Amendment privacy rights should be getting at least as much attention as the government’s perceived need to engage in even more secret snooping.